BroadcastShow Tour October 2013 O ctober heralds the second tour of 2013 for BroadcastShow. The travelling road show of exhibiting manufacturers and seminars visited London, Glasgow, Manchester, Cardiff and Bristol earlier this year with well over 1000 visitors through the doors. For the autumn leg the first stop will be the Europa Hotel in Belfast on 16 th October followed by the Royal Armouries in Leeds on the 22nd and finishing up at Pinewood Studios on the 24 th October. The approach is simple – to give visitors a unique chance to spend time with manufacturers and distributors, to discuss their needs and get hands on with everything on offer in a friendly laid back environment. The day is backed up by unique seminars and for October Philip Bloom will be at every venue with talks throughout the day. 16th Oct - 24th Oct 2013 If you’ve not met or come across Philip in the past then he is a world- renowned filmmaker who, for the past 7 years of his 24-year career has specialised in creating incredible film- like images with low budget video. His most iconic work is created with Canon DSLRs. As one of the biggest evangelists for their use in productions his website became the place to go to for budding filmmakers as well as experienced ones keen to embrace the new technology. His site now regularly has over 1,000,000 visitors a month. His use of Canon DSLRs to shoot part of Lucasfilms’ last movie “Red Tails” proved a huge point to the naysayers. This technology was proved very viable in large-scale productions. Philip has kept up with the advent of newer tools like the C300, F3, FS700, Blackmagic Cinema Camera and 1DC, using them in various productions and undertaking in depth video reviews, which have helped many people in the huge decision of buying a camera. He has worked for all the major UK broadcasters, such as the BBC, ITV, C4 and Sky, as well as many others around the world including CBS, Discovery, FOX and NBC. Independent projects are key to Philip and he mostly works in this field now. One of his most successful projects was “How To Start A Revolution” which won a BAFTA in 2012 and was also awarded prizes at several film festivals including Best Documentary at the 2011 Raindance festival. 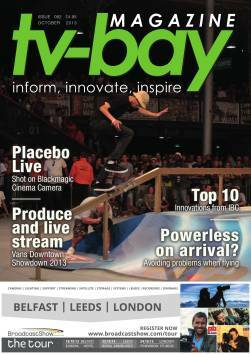 40 | TV-BAY MAGAZINE: ISSUE 82 OCTOBER 2013 Currently Philip is working on various documentary and fiction projects and much more besides. He is constantly stretching his creative abilities whilst still taking time to keep his website relevant and touring the world teaching young and old filmmakers better techniques. Not just through technology but through better storytelling skills. His workshops have been an enormous success around the world and he will continue to run them for as long as possible as learning never stops! Morning Session starting at 11am Technology update: Why shoot 4K? Why Shoot Raw? How can the new technology help you and what will hinder you? We’re in a rapid evolution of technologies and despite what some manufacturers say you may not want to be complicating the task with unnecessary tech. Distilling the equipment and tools to the essentials plus what to avoid, what to invest in now and what to wait for… Afternoon Session starting at 2pm Narrative and Visual Storytelling in the real word. As much as many of us wish we were shooting Hollywood features or high end dramas, the reality is quite different. Philip will be divulging his wealth of experience in how to keep the passion alive doing jobs that don’t necessarily excite you. Tips on how to tell the story (corporate, wedding, film, doc) whilst also keeping yourself motivated and inspired. An essential talk for anyone from people starting in the business through to people of many decades experience.